In the wee hours of the New Year, while Amma was giving prasad to one and all in the Ashram, the brahmachari incharge of the kitchen came to Amma. He told Her that the vehicle delivering the supply of rava to be used in making the morning’s uppama for the relief camps had broken down. 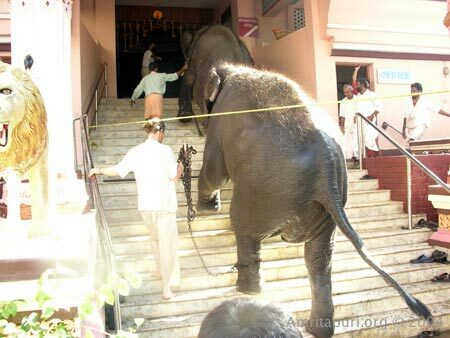 It would take four hours to take another vehicle and get the sacks of rava to the Ashram kitchen. It would take another three hours to prepare the food. 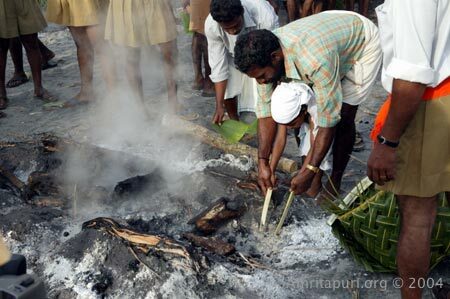 It would definitely not be possible to prepare the uppama in time for its breakfast distribution at the relief camps. Amma immediately told him to contact some devotees living in the nearby town of Kayamkulam who owned shops and to try to obtain the rava and other necessary supplies from them. The calls were made, the devotees were woken up, they greatfully pitched in and the breakfast was made on time. The main concern of the hour is that school is restaring on Monday, 3 January, as the Christmas holidays are coming to an end. The government is asking the evacuees being accommodated in the schools to vacate. Amma has instructed the brahmacharis to start contstructing temporary shelter for the displace on 10-acres of Ashram-owned land in Sryaikkad, about one kilometre from the Ashram. With the turning of the New Year came about three hours of out-of-season rain. In a way, it was a blessing, as the rain was strong enough to give a good cleansing to the land, leaching away the salt, givinng the wilting plants and trees a respite. However, many people staying on the open ground have now been forced inside, resulting in crowding at the relief camps. The two camps run by the Ashram are also becoming more and more crowded, as many evacuees have shifted there from other camps, knowing that the conditions at the Ashram-run camps are superior. Groups of ashramites and visiting devotees—both from India and abroad—have begun regular cleaning and maintenance work at the government-run relief camps. As important as the work they are doing is the feeling of oneness they are creating within the community. 1. 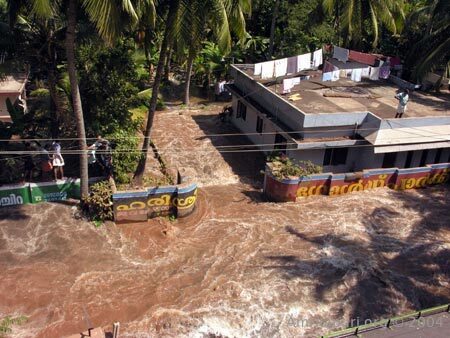 Around 11:00 a.m., an alarm was issued by the office of the Chief Minister of Kerala, ordering people to once again evacuate the coastal areas. 2. 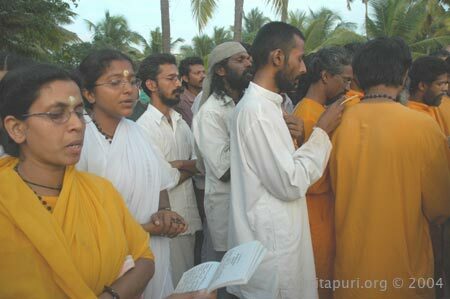 Evacuation from Amritapuri: Amma told everyone to once again calmly go to the other side of the backwaters. 3. After the majority of people had left, Amma came down from Her room and had a look around. She then told the remaining ashramites to shift all the plates, books, mats, cooking pots, speakers and other things being cleaned to higher ground. 4. Amma Herself engaged in the work. 5. Within half an hour everything was done. 6. The remaining ashramites insisted that Amma also leave for the university campus. 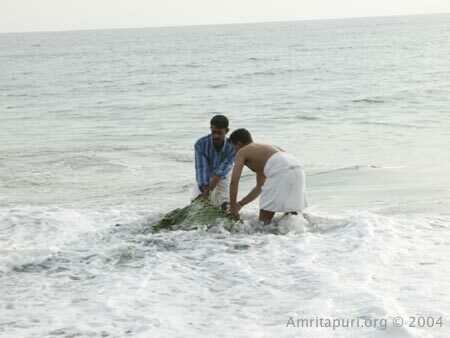 Amma gives in to their request and accompanies them to the campus on the other side of the backwaters. 7. The Indian Government tells all foreign embassies in India to inform their citizens not to travel to the South. 8. The warning was soon taken back. 9. All the visitors of the ashram, devotees from the foreign countries are safe and fine. 10. Back at the University, Amma discusses the future needs of the displaced people with the relief workers and local devotees. 11. 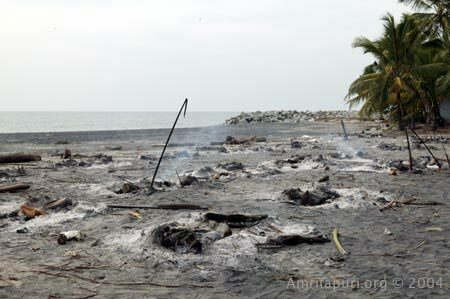 An assessment of the damage to houses on the coast is undertaken on Amma’s instructions. 12. Food, clothing and medicines are provided as usual at the various camps. 13. Volunteers are flowing in, bringing clothes and whatever they think may be of use to the displaced people. 14. 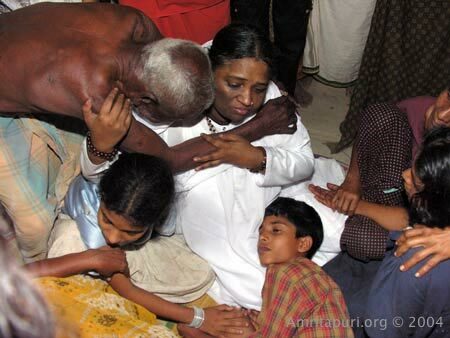 Amma comes out in the night to spend time with Her children in meditation. She sings a few bhajans. 15. Amma is staying in the University campus for the time being. 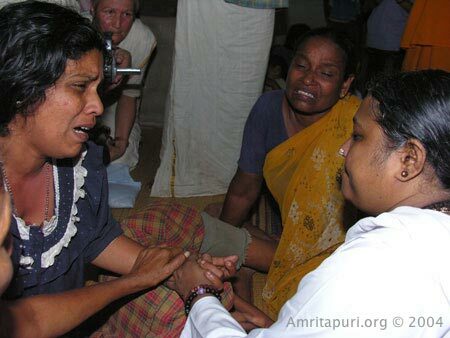 Ashram ambulances and medical doctors are regularly doing rounds of worst hit places. Ashram is supplying food for 4,000 to 5,000 people every day. Food is donated, cooked and packed by devotees. 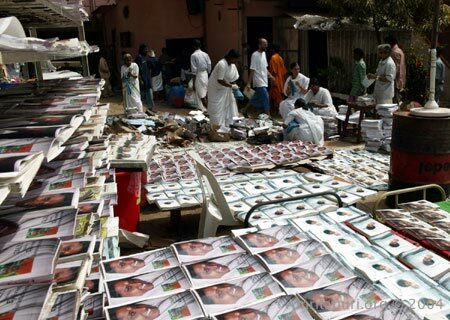 Already more than 10 truck loads of clothes contributed by Amma’s devotees have been distributed. Uncooked rice and other provisions are being supplied regularly. Ashram is also collecting blankets and cooking utensils to be given in distribution. A large number of students and staff from Amrita Institutions are involved in the relief work. Amma has sent a team of three doctors—Dr. Vaidyanathan, Dr. Rajam, Dr. Unnikrishnan and paramedical staff to render medical services. Accompanying them is a team of volunteers who are providing essential services. 24-hour medical centre has been set up with doctors, resources and medicine from AIMS. Devotees are contributing every thing they can: rice, tea, clothes, sleeping mats, blankets, sugar etc. Seriously injured people are being taken to AIMS Medical Hospital in Cochin. Hundreds of volunteers , including devotees, students and workers at Amrita institutions. Relief work continues in all the camps. 1010 kgs. of rice, 900 kgs. of uppuma and 860 liters of milk were distributed today. Many more service organisations are helping the people now, in all the relief camps. Medical team has reported 17 cases of disentry. It can be the indication of epidemic diseases. The Ashram doctors are creating more awareness among the people about hygiene. The visitors and ashramites are staying in the relief camps. Ashram cows move back to their shed. Ram and Lakshmi, the Ashram elephants, are still on the other side of the backwaters. 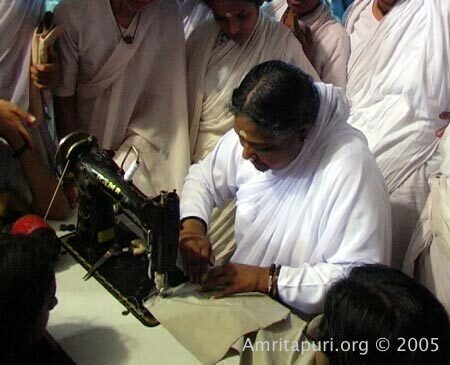 Amma sews an underskirt along with the brahmacharinis who are sewing underclothes for the women at the camps. 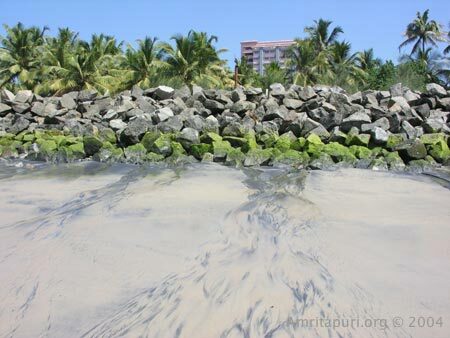 With the entire coastal area around the Ashram evacuated, more than 10,000 people need to be fed three times a day. And this is only taking into consideration the people now housed in relief camps on the mainland. There are even more who have not left the peninsula, but are now without any food supplies, stoves or fuel. 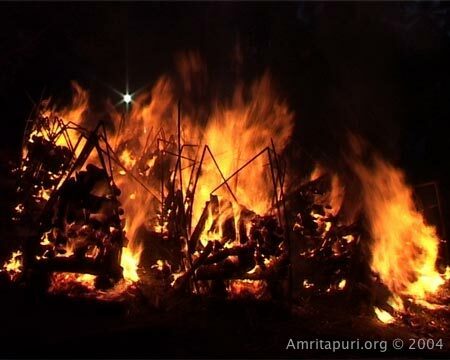 Thus from the minute Amma had the Ashram set up its relief camps, the cooking began. The food is regularly being transported to the 12 centres in the area, as well as to the villagers remaining on the peninsula. Amma herself has visited the kitchen to make sure everything is going according to plan. As the Ashram is used to feeding as many as 20,000 people a day, the ashramites have not had trouble preparing the food. They’ve mainly been cooking rice, uppumav and simple but nutritious curries. They are also bringing fresh water to the people, as many of the wells have become contaminated by salt water or waste. There are approximately 150 ashramites and devotees helping with food preparation, cooking and food serving. It never stops. The canteen is constantly full of brahmacharinis and householder devotees—including many from the West—chopping up vegetables for use in curries. 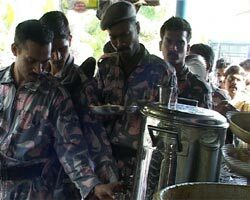 In the picture on the right, commandos are taking lunch served by the Ashram. 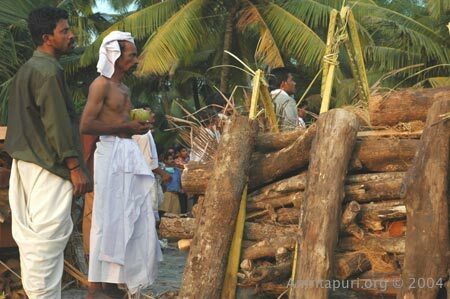 The sun was going down when the pyres were lit at the beach in Azhikkal. As the sun set, its sullen red colour spread across the sky, as if it were sharing the grief of the villagers. The air was filled with the moaning cries of the near and dear ones of those who had passed away. A sight that could move even the most stone hearted to tears. Azhikkal was one of the worst hit villages on the Kerala coastal belt. Most of the houses there had collapsed as the waters surged in, taking away the people inside along with it. 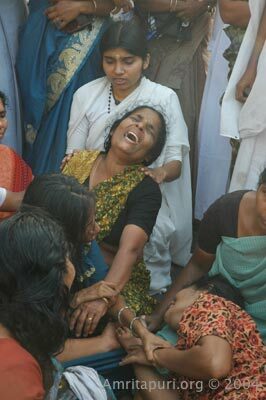 Days later, dead bodies were still being recovered from the backwaters, the fields, under the rubble. One could see utensils, clothes, toys, footwear and so many others things scattered about the open grounds. Whom did they belong to? Are they still alive? Nobody knows. 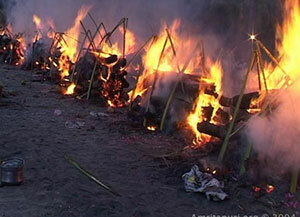 On the 28th evening, a mass cremation was arranged for the 42 dead bodies that had been recovered on the first day and had been lying since then in a mortuary. The relatives of the dead started arriving in large numbers by afternoon itself. A tent was erected for them to sit in shade. There were a number of Ashram vehicles plying up and down the road, bringing in the relatives from the relief camps. 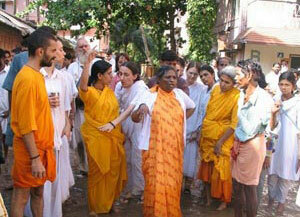 Many of them were staying in the relief camps set up by the Ashram. The Ashram volunteers were also serving food and water to all the people attending the funeral. 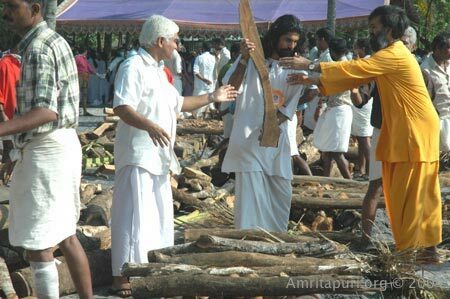 The swamis and brahmacharis had been working since afternoon, shifting logs and firewood, arranging for coconut husks and coconut shells and doing whatever was necessary to help with the arrangements. Many other organizations were also helping in this work. Some were political groups who were totally opposed to each other ideologically. But at this time of crisis, they all stood together and worked as a single unit. Meanwhile Amma’s brahmacharinis were with there as well, consoling the mourning families and trying to give them some strength. Most of the houses seemed to have lost one or two family members. As the bodies arrived, the cries in the air became intense. The bodies were first placed in the tent, so that the relatives of the deceased could pay their last respects. When one coffin was opened, exposing the body of a small child, five different women ran to it, believing it to be there own. Others came and placed gentle kisses on the foreheads and arms of the dead. Many fainted as they paid their last tributes. 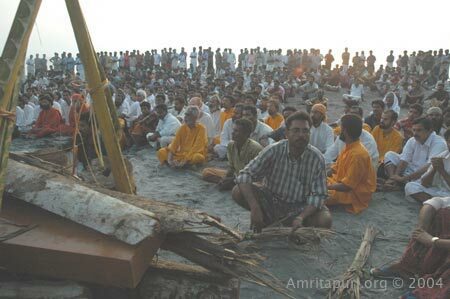 Before the pyres were lit, the Ashram residents chanted the eighth chapter of the Bhagavad-Gita. Soon one could see 40 burning pyres, with the crowd around standing with folded palms, praying from the bottom of their hearts for the peace of the departed. Darkness came and the fires were still burning. Many family members held vigil around pyres all night long. The Ashram volunteers, who had been working since morning, remained also. Actually, they were the last to leave. The sun had set. 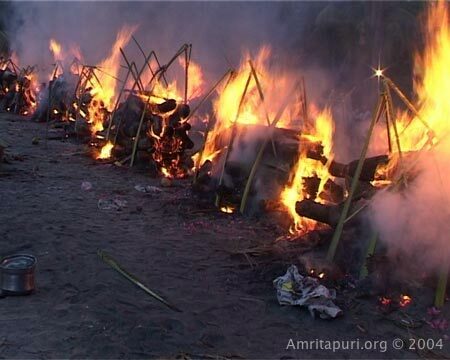 Two kilometres up the river in Azhikkal, the villagers had just set flame to 42 bodies. In the relief camp set up by the Ashram, the only sound was that of crickets. From the college, Amma walked silently to the field behind the building and sat down, facing the backwaters. She closed her eyes. Soon many of ashramites were seated around her in meditation. A little after 7:00, a harmonium was brought, as was a simple microphone and amplifier. Through its tiny speaker, Amma began to sing a sad-sounding prayer for happiness. 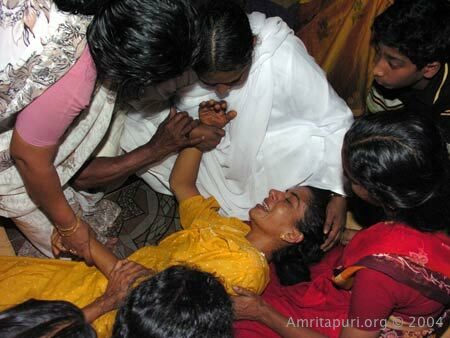 Amma’s voice was the only amplified sound, so it alone was carried out into the night. Her tampura, the drone of the crickets. Could they hear her? Those who would never see their husbands again… those who would never see their wives… those who would never touch their children again… never know their mothers and father? In that darkness, was her voice some how holding them—perhaps even without them even knowing it? Amma sang this refrain for almost 15 minutes straight. Each time the gravity of the line seemed to increase. Each time the devastation of the past three days seemed more inescapable. Clearly many ashramites were thinking back to just the week before when Amma had twice sung this very song—both times ending in tears. When the song was over, Amma sang a few more bhajans, then led everyone in a short meditation and announced She was returning to the Ashram. With the turning of the moment, the destruction was over, and the rebuilding had begun. 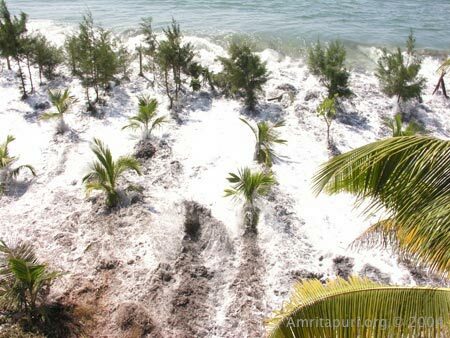 Ashramites and devotees share their experiences of the tsunami in Amritapuri. “However I soon realized that my mother was in fact receiving a precious blessing—to participate in the around-the-clock veggie-chopping at the relief camp, to witness the Ashram boats continuously dispatching enough food to feed 10,000 evacuees, to see the villagers being given shelter, clothing and solace, and most of all to experience what it feels like to be part of a bigger family, one that knows no boundaries of culture, religion or colour, where all are the darling children of one Mother. “For us who live with Amma throughout the year, this is an occasion to realise how little we know Her, how little we have understood Her limitless compassion, how utterly impossible it is to gauge the depth of Her immense heart that melts with love for every being of this vast world. “I was in the kitchen, when it hit. The water level rose very fast. There was no time to move anything. Soon around 150 kg of cooked rice was floating in dark-brown water. One large pot containing some rice just started floating, as if it were a ship! “As soon as the people were across, Amma started telling us to send food. All the cooked food and veggies we loaded in handcarts—quite hard to push them through the mud to the boat jetty, but we had lots of volunteers. The good news was that, as Amma had called for Devi Bhava, there was already enough lunch for all the devotees, ashramites and the first wave of evacuees from the village. “Amma has always said that the very next moment is not in our hands, but until the 26th December I had never had a near-death experience. 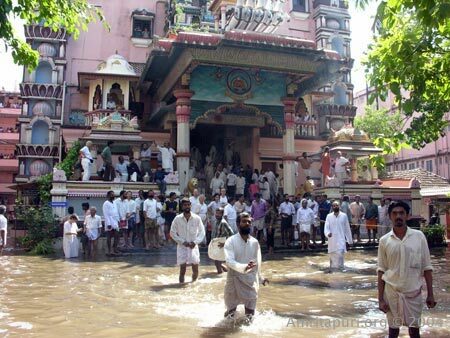 When the water from the sea came and flooded the whole Ashram, we all experienced the grace of the Guru’s umbrella, and not one person was hurt. 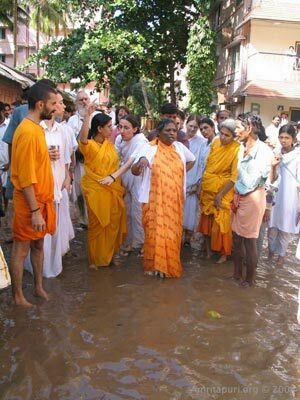 When the flood struck, Damayanti Amma, Amma’s mother, was immediately taken across the jetty to the mainland. But when she reached the other side, she immediately realised the Suganandan Acchan, her husband, was still at the Ashram. “What? Acchan is still there?” she said. “How can you bring me and not Acchan? It is not right. It is my dharma to be with my husband. No, you take me back right now. I will not stay here without him.” Damayanti Amma was so adamant that Amma’s brothers and sisters had no choice but to take her back across the backwaters. There they found Acchan and together Amma’s parents returned to the mainland. 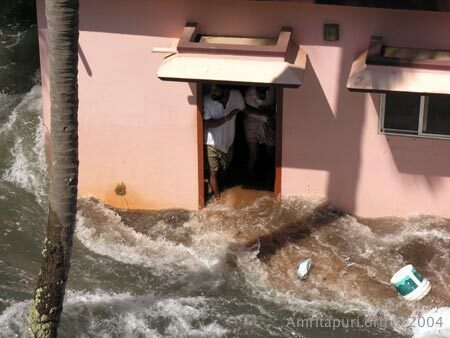 “When the flood arrived, I was sitting next to Amma and I never felt in danger. We were advised to go to the roof of the temple. From there, I could see the work of Amma and of the swamis and brahmacharis as far as saving people and coordinating everything. We were quickly moved to a safe place, Amma’s Engineering School, and offered an excellent meal. Through the next days, support was good and we didn’t lack anything. When we finally came back to the Ashram, it was already in order. 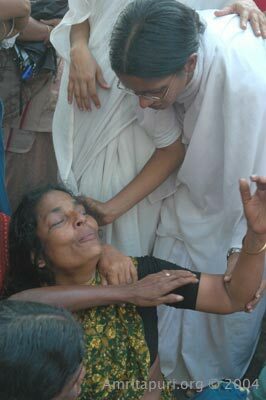 During all this coordination, Amma found the time to console the grieving families one by one, sharing their suffering. They were supported emotionally and materially. “It was six days after the flood during darshan that some of the pain and loss experienced by the villagers truly hit me. In front of me, a local man was telling Amma of his losses. I felt teary, then deeper and deeper sorrow. Five to 10 minutes must have passed as I choked back tears. Finally my turn to have a hug came and I was sobbing as Amma held me to Her breast. Later, crossing the backwaters, I was overcome with sorrow for the absence of fisherman busily heading out to sea in their boats and no nets dipping down to catch what they could. Immediately after the flooding, Amma ordered six ambulances from AIMS Super Specialty Medical Hospital in Cochin to be sent to the Kollam District in order to facilitate the Ashram doctors in treating the distressed and injured. The ambulances were fully equipped with medicines, ventilators, etc., even having the capacity to house small operations. As soon as they reached, 10 doctors accompanied by teams of assistants, began making rounds of the all nine relief camps in the mainland. They also made trips into the evacuated coastal area from Azhikkal to Pandarathuruttu. Within 48 hours they had already distributed more than four lakhs [Rs. 400,000] worth of medicines and served more than 2,000 people . They are helping all they can, but for some wounds there are no painkillers.